Business premises on the High Street, vacant as of March 2019. 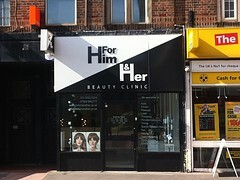 It was previously a beauty salon called For Him And Her, but according to a notice in the window photo this became a mobile-only service in January 2019. It was previously a beauty salon and training centre called ABT Laser Centre photo, advertising shellac nails, eyebrow threading, facials, manicures, and pedicures, as well as diploma and NVQ training in various beauty-related subjects. ABT moved to 810 London Road, Thornton Heath, some time between February 2013 and June 2013 photo of sign. As of October 2013 the premises were vacant photo. Another beauty salon called For Him And Her opened some time between then and March 2014. As of November 2015 there was a sign in the window celebrating the salon's 2nd anniversary photo, which suggests it opened in October or November 2013. According to a notice in the window photo, For Him And Her became a mobile-only service in January 2019. As of March 2019 there was another notice in the window photo stating that the lease had been forfeited. Last edited 2019-03-26 18:13:48 (version 38; diff). List all versions. Page last edited 2019-03-26 18:13:48 (version 38).